Whisk together marinade ingredients and set aside 1 tablespoon for basting later. In shallow dish, cover chicken with marinade until well coated. Cover and marinate in refrigerator for at least 2 hours. 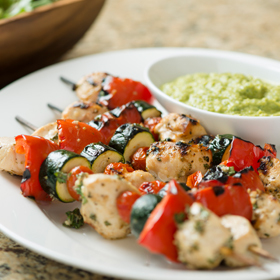 Using 4 kebab skewers, arrange 3 pieces of chicken and 2 pieces each of zucchini, pepper and tomatoes per skewer. For easier grilling, start and end each skewer with chicken. In the meantime, for dressing, place ingredients in food processor or blender. Puree and set aside. After removing kebabs from grill, let stand 5 minutes. Serve with dressing on side. Cook meat to recommended internal temperature. *An alternative cooking method is to preheat oven to 400 degrees. Place skewers on shallow baking dish on center rack. Bake 10 minutes. Baste and turn over, baste and bake for additional 10 to 15 minutes or until chicken is cooked through. Serving size: 1 kebab. Amount per serving: 200 calories, 8g total fat (less than 1g saturated fat), 10g carbohydrates, 21g protein, 3g dietary fiber, 105mg sodium.